All of us—regardless of identity or affiliation—need access to information in order to make empowered civic decisions. 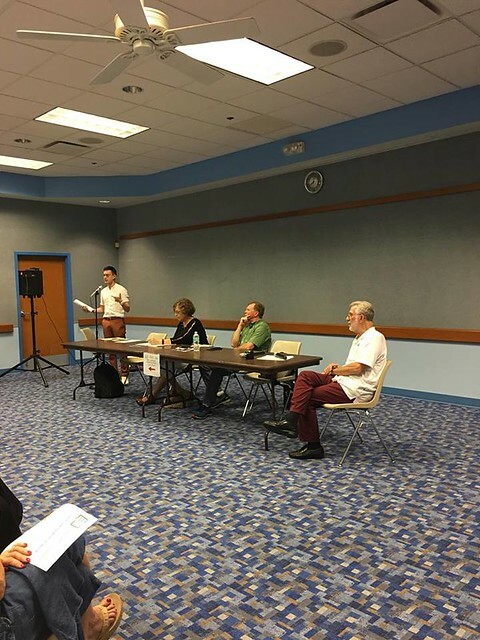 At this free event, panelists talked about what communities can do to strengthen local media, and what a strong free press can do to enact social change. David B. Axelrod is event coordinator and director of the Creative Happiness Institute. He is author of 22 books of poetry, most recently, All Vows: New & Selected Poems. As an author and editor of the critical biography, Merlin Stone Remembered, Axelrod won a Florida Book Award Gold Medal. He is a three-time Fulbright Award winner and Fulbright’s first Poet-in-Residence in the People’s Republic of China. He served as Suffolk County, Long Island’s Poet Laureate before currently sharing the title in Volusia County. Kyle Dacuyan, keynote speaker and panelist, is the senior manager of literary outreach & activism at PEN America, where he facilitates partnerships with other cultural and advocacy organizations, and leads PEN America’s community engagement funding for members, writers, and other allies. He currently manages the Press Freedom Incentive Fund, a resource for locally-led projects on issues around media truth, representation, information access, and local news viability. He engages writers in public action and other forms of advocacy, and has previously been an organizer for LGBTQ+ rights and immigrant justice. George Griffin is one of the founding members of the Volusia/Flagler Chapter of the American Civil Liberties Union (ACLU). He was on the board their very first year, and became president of the chapter in the year after, a position he has held for over 10 years. He also serves as the Northeast Florida at-large representative on the State Board of the ACLU of Florida. When he is not “being a rabble-rouser” for the ACLU, he is a full-time speech professor at Keiser University in Orlando, and an adjunct professor at Stetson University since 1995. Pat Rice is editor of the Daytona News-Journal. For nearly eight years, he has guided D N-J through a changing media landscape, maintaining the paper’s circulation in the top 100 papers in the United States out of 1200, with a circulation of over 100,000. 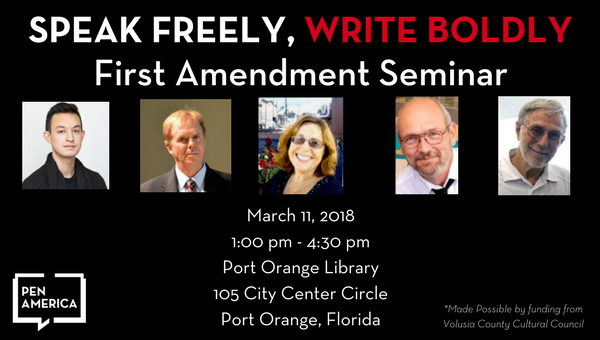 He is on the board of the Florida First Amendment Foundation and an advocate for journalists’ and authors’ rights. Ricki Stofsky, a three-time Emmy-award-winning television producer-writer, has an extensive track record in news and entertainment programming. During her 13 years at WNBC in New York City, she was writer/producer/Senior Producer of newscasts and contributed to the Today show and Nightly News. Other work includes Entertainment Tonight, Fox/5’s Good Day New York, the Food Network, and the Wall Street Journal’s “Morning Show.” She is author of Behind the Deadlines: Secrets of a TV Newsroom. Cosponsored by PEN America with funding made possible in part by the Volusia County Cultural Council.